1) Pickard China is made in America a fine china company since 1893, what kind of china are you known for? Pickard China is a fine porcelain china company best known for luxurious gold, platinum and cobalt-based china patterns. 2) What are some of the legacy stories of the company? Pickard's oldest active pattern introduced in 1962 is called 'Crescent'. The inspiration for this pattern came when my Uncle Pete Pickard saw a beautiful crescent moon rising over Lake Michigan on his way home from a party. 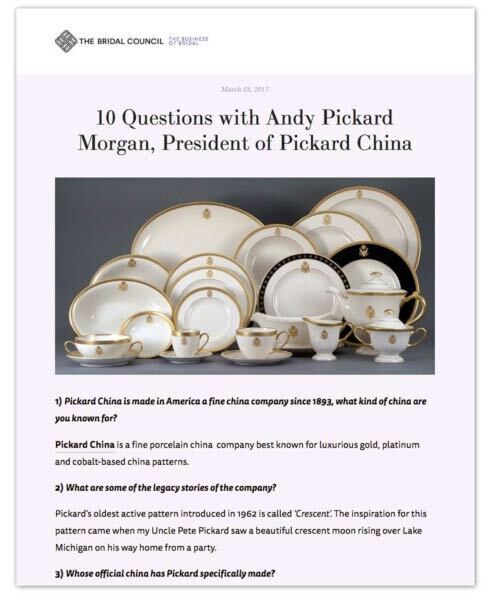 3) Whose official china has Pickard specifically made? The Pickard Government Division has made china for The White House, including First Ladies Michelle Obama and Laura Bush, the U.S. Department of State U.S. Embassy since 1977, Air Force One, Camp David, both houses of the U.S. Congress, 4 branches of the United States Armed Forces, and many other United States government departments and agencies. Pickard has produced numerous custom china services for many of the country's Fortune 500 company's such as Bank of America, Coke Cola, Ford General Electric, General Motors and Merrill Lynch. Country clubs are another area Pickard has provided custom china services to, including some of the country's most prestigious clubs: Augusta National Golf Club, Winged Foot Golf Club, Lost Tree Club, Yeamans Hall Club, The Wanderers Club, The Links Golf Club and many others. Pickard has also provided custom china services to many colleges and universities across the country including Boston College, Emory University, Harvard University, North Carolina State University, Princeton University, Texas A&M, University of Notre Dame and many others. 4) Your specialty is monograming, how has that helped the independent retailer and why is that important? Pickard's number one retail collection is our monogram china. This is a great collection for our high-end retailers, as a monogram china order is always a unique and custom order. It is not something one can find on the internet, therefore if one of our retailers works with a bride to set-up their Pickard monogram china bridal registry, they can be assured that they will get the entire sale. Again, the store in question is the only location wedding guests can use to purchase the customized monogrammed Pickard china. 5) Is monograming a cyclical business? Monogram china does have some peaks and valleys in terms of popularity. However, there is a strong base need and perhaps appeal for monogram china, so the valley is not too bad and the peaks are tremendous. 6) What is offered in monogramming? Pickard's custom monogrammed fine china includes the choice of 16 different font types available in either gold or platinum along with the possibility to add in one of six different colors with precious metal banding. Over 40 different pieces are available for monogramming. 7) What designers has Pickard China partnered with? 8) What do you look for in partnering for your brand? We look for outstanding designs from a partner with a strong brand, strong name recognition and strong social media following. 9) Tell us about Hallo Home. How has that grown your business? In 2016 Pickard inked a deal with Halo Home from Dallas, Texas. Halo Home is a monogram linen company with beautiful and ornate monograms. We were able to transform Halo Home's beautiful linen monograms onto Pickard China and form a new program that has already been enormously popular. One of the owners of Halo Home, Kimberley Whitman, has published a book on monogramming and has a tremendous social media following. 10) What other brands do you distribute? Pickard is the exclusive U.S. distributor for the Pickard Crystal by Royal Brierley, PORCEL Fine China, Herdmar Fine Flatware and Cristal de Paris.